Description: Eastbound intermodal locked down just west of the Saginaw Interlocker. Both engines were shut down and the only noise I heard was clicking from the air lines. Description: Since I was short on shots for this day, decided to give you a 3/4 rear shot of both engines on the eastbound intermodal holding prior to the Saginaw Interlocker. Description: NS 9744 leads two BNSF D9-44CWs with a westbound stack train over the Rockville Bridge. Description: BNSF heads east outside of Savanna, IL cruising through the now barren farm fields. Description: An eastboung empty grain heads through the falling snow. Description: This was the 5th of the day. Description: Two slow BNSF units in elephant style. There was a third unit behind these also in elephant style, but I didn't get it for some reason (it was BNSF 4914). Description: BNSF lash-up passing the now demolished coaling tower at Collinwood, Ohio. Description: One of the many Z trains on the BNSF rolls through University shortly after 290 departed. Description: Second unit out on a stack train, check out how much its smoking. About 10 seconds before I shot this, it was belching out black smoke. Description: BNSF 9244 (SD70ACe) & 5304 (C44-9W) lead a unit train WB near Leavenworth KS. Title: BNSF 5342 and siter dash 9 sit in the siding for track equiment to clear up. Description: while waiting for track work to clear bnsf 5342 cool's it's heel's. Description: Eastbound BNSF at the east end of Lake Charles. 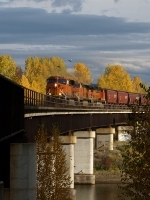 Title: BNSF 5380 Heads up Nb with a mixed freight!! Description: Nb freight train rolling up the Hannibal Sub.